A father claimed a hospital charged him nearly $40 to hold his baby after the child was born. 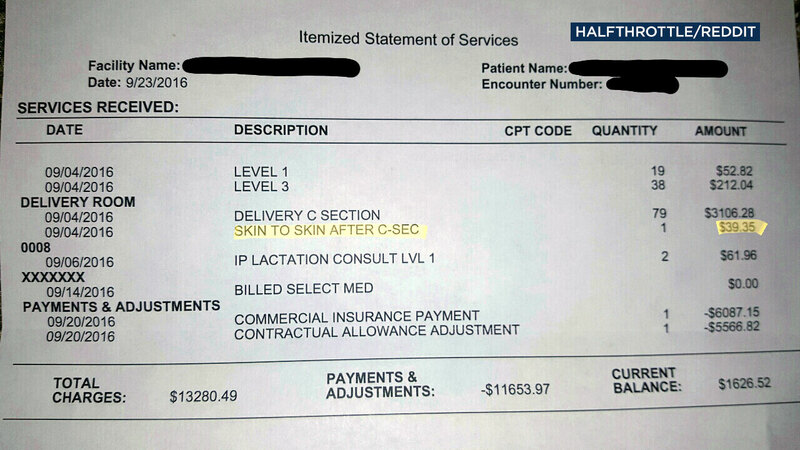 A father in Utah said he and his wife had a good laugh after they received an itemized bill from a hospital charging them $39.35 for skin-to-skin contact with their newborn son. Ryan Grassley, 37, posted a photo of the bill to Reddit and said he had requested it after his son Samuel was born on Sept. 4 through a C-section, according to the New York Daily News. The moment Lidia Grassley had skin-to-skin contact with her newborn son Samuel on Sunday, Sept. 4, 2016. Grassley said he and his wife Lidia, 35, had a good experience with the staff at the local hospital and were not posting the bill to complain but because they thought it was funny. "We had a very positive experience during the birth of our son, and the hospital and staff were great throughout the entire process," he said. In his Reddit thread, Grassley said the nurse in the operating room let him hold his son while Samuel was resting on Lidia's chest. He said the nurse even grabbed his camera to take a couple of photos for them. Ryan Grassley, his wife Lidia and their son Samuel are shown moments after he was born on Sunday, Sept. 4, 2016. To keep the humor going, Grassley also started a GoFundMe account to reach his goal of $39.35 to pay off the fee. According to the page, it only took seven people within 10 hours of posting the account to reach his goal. He joked that any money he receives after reaching the goal will go toward a vasectomy "because I never want to go through these sleepless new baby nights again." In addition to their newborn son, the couple also has a 2-year-old daughter named Sofia, according to the New York Daily News. 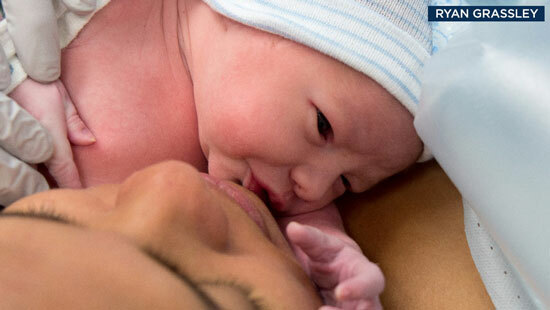 Studies have shown that skin-to-skin contact with the parents and an infant immediately after birth can contribute to the overall health of the baby in a positive way.